Religion: Everything is possible. Sightseeing tours of Greek Orthodox churches and monasteries > Visit to holy sites > In the footsteps of St. Paul, Lazarus and other saints > A trip to the Holy Land (only a stone’s throw from Cyprus) > Ecumenical Meetings, and much more. 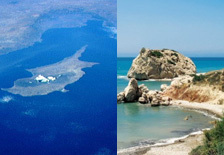 History and Culture: Cyprus offers you a panorama of world history. A journey back to the Stone Age > Antiquity lives > In the footsteps of the Crusaders > Castles and Forts > Medieval life > Frescoed mountain churches, and much more. Special Interest ‘Nature Trails’. Cyprus - the world in a nutshell. Hiking in the Akamas Nature Reserve > Explore the Troodos Mountains > Discover Cedar Valley > Enchanting coastline > Fishing shelters, villages, monasteries, and much more. Special Interest ‘Authentic Cyprus’. It’s a beautiful world. Enjoy a tour across the unspoilt countryside inland > Köhler, potters, copper and silversmiths > Villages where time stood still > Secrets of the North, and much more. Special Interest ‘Adventure’. Cyprus is the home of adventure! Fishing with the fishermen of Latchi > Join in the orange or olive harvest > Meet the artists in Lempa and Lania > Fishing in the dams of Cyprus > From grape gathering to wine tasting, und much more.